American artist Jacob Dancy has been based in Berlin since 2014. 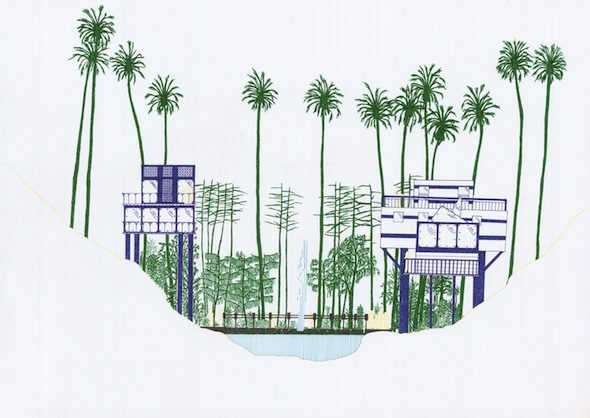 In November, Bertrand Yom Gallery presented a solo show of his drawing series ‘Stadt der Parks’. 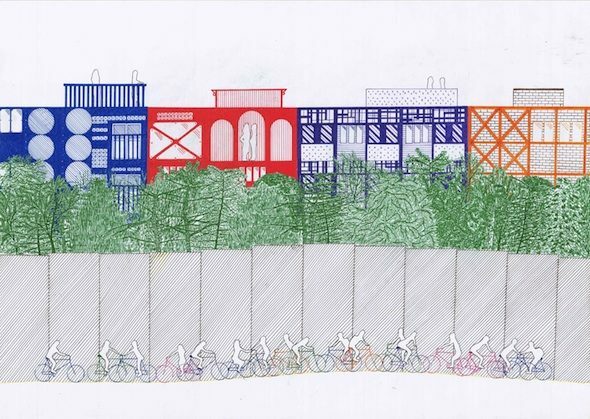 The drawings depict imaginary sites of human organization—maps of nonexistent cities, architectural blueprints of beach jetties and bike paths. Suspended between the rigor of a schematic and an illustrated dream, his works play with the viewer’s sense of urban and mental space, the language of a landscape, and the form of a diagram. Nathaniel Marcus: What is your process like for these drawings? 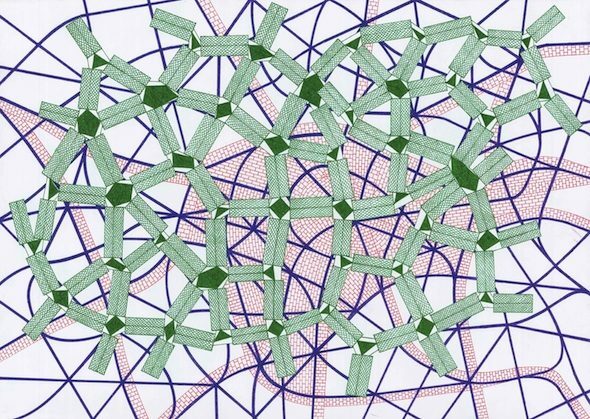 Is a work such as ‘Stadt der Quadrate’ executed as a pre-formed idea (as in, “a city structured by quadrilateral blocks”) or do the concepts kind of congeal as you draw freely? Jacob Dancy: There are usually two phases to my process, and ‘Stadt der Quadrate’ may be one of the starkest examples of these two phases. First, I keep sketchbooks where I work quite freely. I tend to develop forms, patterns, color combinations, etc. that I feel drawn to. I might call this the concept phase. By the time I get to working on the actual drawings, or the execution, I usually already have a firm idea of how the page will be composed. In the case of ‘‘Stadt der Quadrate’: yes, I had conceived of a city of quadrilateral blocks. In some of the works, there are examples in which I was somewhat more improvisational, in which the form somewhat guided me as I went. For the most part, however, the drawings are already completed, with respect to their compositions and forms, before I begin to actually draw them. I use physical stencils and rulers and also develop mental stencils throughout my process. This makes it much easier to repeat given forms, which I’m seemingly fascinated by. To say one more thing here, I often find myself thinking about the idea of constraints and freedom in my process. I do find that I tend to work better with a set of constraints (all the drawings are A2, the whole series includes 12 colors). In the execution of the drawings, I often spend much time drawing repetitive parallel lines or stenciled forms. Looking back at this series and my process, I think these constraints afford me a certain amount of freedom. Drawing for me is meditative and escapist, maybe even mindless. Often people see my work and when they are only a few centimeters from my drawings, their first response is that they have a maddening or distressful quality, because of these obsessive repeated shapes. NM: How does your approach change when you work on a bird’s eye view, map-perspective like ‘Stadt der Quadrate’, versus the more architectural blueprint of a structure like ‘Lotusteich’? JD: This is a very poignant question and actually nobody has asked me this before. First, I will add that throughout the series, I developed two types so to speak – the bird’s eye view perspective in ‘Stadt der Quadrate’ and the architectural elevations like ‘Lotusteich’. For whatever reason, it was important for me to have an equal number of both in the series. Perhaps the greatest difference in these approaches is that the architectural drawings are more asymmetrically composed. They begin with a conventional horizon line and have a sky and a ground. 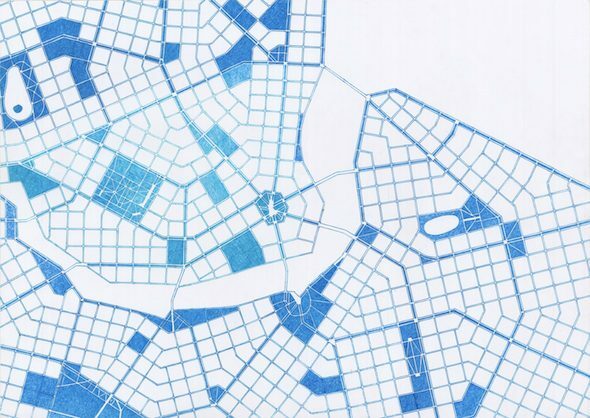 The more map-inspired drawings have patterns that could float off the page. Some of them could read quite similarly if they were flipped horizontally or vertically. More specifically to my actual drawing process, both the architectural and map drawings tend to be composed of a series of planes. For example in ‘Lotusteich’, the pond and fountain are the first layer, followed by the second layer of the two houses, and finally, the foliage is in back. In the architectural drawings, I think in these planes, and usually work systematically from front to back. The map drawings often contain layers as well, although for those drawings, I am not composing objects in front or behind one another as in a scene. Instead, the markings are meant to be representative of information. NM: How does your experience of language, your reading and writing practices, interact with the practice of drawing? It seems very intentional to me that the titles of the works in ‘Stadt der Parks’ are in German. JD: It is difficult to describe and perhaps doesn’t communicate to others looking at my work, but I think the experience of being in a new and foreign place informed my work throughout this series. In the short text that accompanies these drawings, the perspective belongs to a first-person narrator who becomes acclimated to a novel and strange place. The names are partly in German because when one is in a foreign place, one usually uses the local language to name given landmarks, even if one doesn’t fluently speak the local language. I wanted to slightly play with this experience, although I was not drawing Berlin itself. ‘Hauptbahnhof’ is a drawing motivated by the form of Hauptbahnhof itself, ‘Das Passagenwerk’ is inspired from Alexanderplatz, etc. NM: Having lived in a number of cities in the past few years (Berlin, a residency in Lisbon, Chicago, and Los Angeles), how would you say each location affected your work? JD: In general, I am prone to theorize and aggrandize cities. I feel drawn to cities with such big reputations, which has absolutely informed this series to create a strange city of my own. More specifically, Los Angeles, Chicago, Berlin, and Lisbon each have drastically different histories and ways of being organized. I think my experiences in each of those respective places offered me food for thought that of course comes through in my work. I am thankful to have had the opportunity to subject myself to new scenery, which is important for any artist. To look back at the last few years, however, it is difficult to say how each place changed me particularly. I suppose I am the amalgamation of all those experiences. Nathaniel Marcus is a poet and journalist based in Berlin.